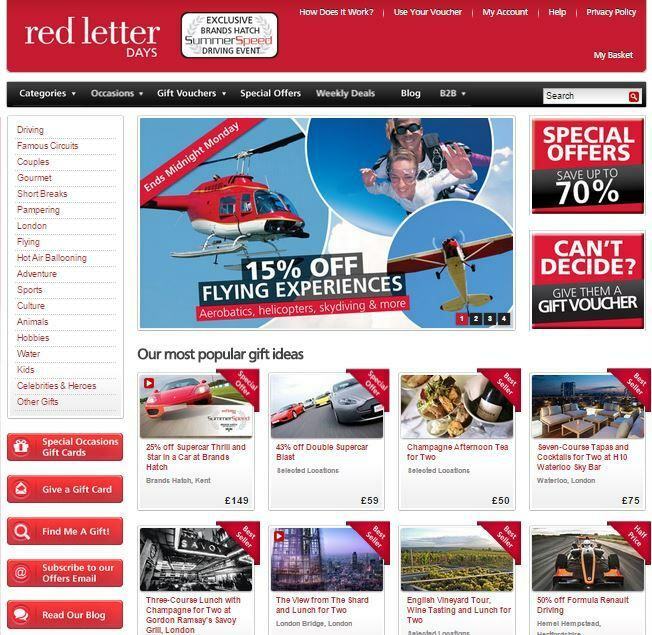 For some of the best London attraction deals, Red Letter Days is the place to go. You can experience days out in driving, flying, hot air balloons, adventure, sports, animals and much more – so there’s something for everyone. From special occassion experience days to gift vouchers for loved ones, you can experience all they have to offer in a number of different ways. With a site that’s easy to browse and activities that are easy to find, you’ll be booking your first Red Letter Day in no time. Just watch out for the delivery fees! Experiences in Driving, Famous Circuits, Couples, Gourmet, Short Breaks, Pampering, Flying, Hot Air Ballooning, Adventure, Sports, Culture, Animals, Hobbies, Water, Kids, Celebrities & Heroes and more! Red Letter Days is perfect for those looking to try something new and exciting with their free time – all while still on a budget. With amazing experience available from driving and flying to gourmet restaurants, there are gift experiences for everyone. London attraction deals are better than ever at Red Letter days, so have a browse and find an adventure that you’ve never experienced before. Check out our Budget Entertainment page for more great deals on travel and attraction in the capital.